Big news here isn't necessarily farming related, but may be of interest to those who have come to know us on a more personal level - Shain completed a 154 mile gravel road bike race on Saturday, called the Around the Rock Ride that starts in Victor, Idaho, goes around the Tetons, and ends with climbing the Teton Pass and back again into Victor. He was the oldest rider to finish (in one day) and did so in just under 12.5 hours. With the support of a great friend, he rode well, finished safely, and had the ride of his life. An awesome side note is that because of his whole food, plant based eating, his recovery was quick and fatigue was minimal. I am so proud of him (and so grateful for his safety). Shain wrote about his ride (and more) on his personal blog Our EverGreen Life, link here or on the right hand column of this website. You are getting a big bunch of garlic scapes this week, and next week too. They are ON for just a few weeks of the year. We pick them now while the stalk is tender and edible, or they will soon grow past their prime and go to waste. So, CSA members get the bounty. This is a crop you can do so much with! They can be enjoyed fresh or preserved for later. Please google garlic scape recipes for ideas. Personally, we make a lot of garlic scape pesto, which freezes well. I've also got a stash of chopped scapes in the freezer (cutting goes quickly with a pair of kitchen scissors). This veg will stay fresh for a long time, even up to a month, if kept in a loose plastic bag in the crisper. Recently planted: collard greens, more cilantro and parsley. About to be planted: more spinach, dill, more beets, another round of salad greens. Workshare Carol sent me this idea for using up your radishes. 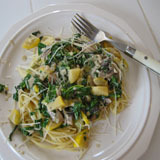 Sauteed Radishes and Spinach (photo above). She says her husband loved it. Flooding update: Pump 2 is no longer pumping water from the sump hole in our basement! We are down to having only pump 1, which is in the french drain in our front yard. It's been running 100%, 24/7 since May 10th! That's a lot of water coming at our house, a lot of water these pumps have kept out of our basement! I am so hopeful that by this time next week we will be about over with this ordeal. Hello toilets! For the record, we've now gone 45 days without a septic system. This beats our record of 44 days back in 2011, although this year we had it so much better with the alternate grey water plumping Shain installed. Thank you Shain! Japanese Turnips - a big bunch, they are ON! Shain asked me to make egg rolls for his Fathers Day meal. I used up all our radishes (including the leafy tops), a dozen or so Japanese Turnips (and the greens), some store bought carrots, a lot of boc choi and Chinese cabbage, 2 small bunches of scallions, a few handfuls of celery, 4 or 5 garlic cloves, and a little veg broth (instead of oil). I chopped and mixed most of the ingredients in a bowl and then sauteed in a pan until everything cooks down and is tender. I usually have the ingredients cooking in two pans to go quicker, then mix all the cooked ingredients together in one large bowl. (I was going to add ginger, but forgot.) Egg roll mixture is then rolled into store bought wrappers. I fried half the batch in peanut oil (for our teenager), the other half was baked in the oven at Shain's request, a healthier option that he prefers. I like that there was enough veggie mixture left over to put in the freezer for another meal. Shain's other Father's Day requests were for the new book This Cheese is Nuts by Julie Piatt (teaches how to make non-dairy cheese), and that we watch the documentary What the Health which just came out on Netflix. Yeah, our family celebrations are a little different, much our my teenager's chagrin (but he's used to us by now, and doesn't complain that much). New to garlic scapes? Here's a link to a description and recipes we've collected over the years. This is the very first harvest off our 10 rows of garlic. They are small and very tender, maybe even a little more mild. But with this heat, they are about to take off! In a few days they'll have doubled in size and become quite plentiful. We love garlic scapes! They can be cut into small pieces and added to the egg roll mixture I posted above, or added to stir fry or other dishes that calls for garlic. This first little harvest is maybe just enough to add to things you are already cooking. The bigger shares you'll be receiving over the next few weeks can be made into pesto, hummus, frozen, dehydrated, etc. Flood update: Water levels seem to be dropping each day, which means we are pumping less at our home. Only two pumps running now. Pump 2 is intermitting on and off about equally. I won't be surprised if we get one more surge of water, but will be very happy if we are really on the down side of all this. As of today, we've been pumping water for 41 days and our septic system has been flooded for 37 days. This hot weather is getting hard to work in, but knowing that it is helping our situation makes me happy. Bring on summer! Arugula - Surprise! The cool weather kept it from bolting too much, so we were able to get one more small harvest. A second cut is never as pretty as the first, but just as delicious. *Keep your eyes open for wood chips within the inner layers of the pac choi and Chinese cabbage. Because of the cold temps and constant rain on that particular harvest day, we opted to try another washing method. Simply spraying the plants clean doesn't quite get out all of the debris (as opposed to our usual method of total submersion). We harvested our biggest pac choi and Chinese cabbage plants this week and then quite a few small or "baby" sizes. Everyone gets approximately the same amount of each, but the sizes will vary. We harvest the smaller plants to make room for the cucumber and tomato plants that are growing along side them (see photo above). This is one of the ways we are able to get two crop rotations from the valuable space in greenhouse 6. First we plant rows of the cabbage, pac choi, lettuce heads, etc. Then when it's warm enough, we'll go in and plant cucumber and tomato plants down the very same rows, spaced carefully in between the first crops. As the cabbage, pac choi, etc. gets larger, it needs to be harvested to allow sufficient room for the very important cucumbers, tomatoes, etc. It's tricky, but it works. My favorite uses for pac choi and Chinese cabbage is to make egg roll "stuffing". Here is a link to a recipe I've used, but now I just chop up whatever veggies and greens I like or have on hand, saute in a pan with a little oil, drain off liquid, and then pack into freezer bags. You can also add your favorite ground or finely chopped meat or tofu. Don't forget that the turnip greens, and even the radish tops, are completely edible. 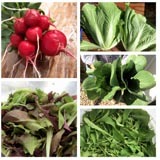 These greens can be added to healthy smoothies, in soups, egg roll mixture, salads, stir fry, etc. Get creative and use it up! Farmer Shain tells me the garlic scapes are just starting to form. Recently planted: shallots and pole beans. Will plant soon: French fillet beans, melons, more salad, more peas, fall carrots and beets, and hopefully collard greens. He's also spent an incredible amount of time dealing with snapped ropes that are supposed to be holding down the plastic on greenhouses 3 & 4. Wow, it's been a windy year. He's also become quite the expert on plumping and sump pumps. Flooding update: "They" said the waters would go down a bit after this cooler weekend and that has been the case for us. "They" say it will go up again one more time later this week, for about a week, and then be done. Let's hope this is the case. We've had some fiascos with malfunctioning pipes and pumps in the last week, but after multiple repairs and trips to the hardware store, things are holding strong again. There were a few nights of limited sleep due to Shain and I taking turns watching and checking on our pump situation, but that is also behind us now and I tell you - sleep is good! It's a nerve wracking situation to know that the only thing keeping your home from flooding are a 3 pumps running night and day. And when even one pump isn't running well, things can go bad quickly. Thankfully, we are back to a dry basement, full use of our grey water system, and sleeping in our own beds again at night (as opposed to sleeping near the basement stairs so we can hear a water alarm go off in the middle of the night). *As of today, Shain says we are down to only 2 pumps! Please share your recipes and food photos with us. We would love to add them to this blog and website. This was by far my favorite meal from last week's CSA share - Shain's vegan arugula pizza: flat bread, vegan Alfredo sauce, tomatoes, mushrooms, and fresh arugula. He used up the rest of our arugula by adding several handfuls to a basic hummus recipe. That sure takes things up a notch. And then there were all the daily fresh salads to enjoy. Shain eats the radishes like candy. Planted recently: dill, mint, cilantro, sorrel, Italian parsley, pole beans, broccoli, cabbage, squash, zucchini, fennel, camomile, and our second outdoor plantings of carrots and table (red) beets. Flooding update: Our grey water system is up and running! Hallelujah! Showers, sinks, dishwasher, laundry - all such wonderful luxuries after 18 days of repeated trips to our neighbors. The water levels are really high now, highest since the beginning of all this, so we have activated pump #3 to keep our basement dry. So far, so good. Our flooding isn't visible to anyone visiting our home or farm. People may wonder "Why the blue out house? ", but otherwise, all our water issues are underground. But they are still very real. We are pumping around 10,000 gallons of water per hour away from our home in an effort to keep it from pressurizing through and/or rising into our basement. The septic is flooded so we've plugged that plumbing off to keep debris or contaminated water from coming into our house. Some say we are in under a flood warning through the weekend. Others say it's already peaked and going down, or will very soon. At our house, it's still rising. We are prepared for the worst, but we still have some wiggle room with that 3rd pump just starting to be used on ground water today. We also have loaner pumps on standby if needed. It's amazing to see so much water flowing in the sump holes and out of the drain pipes around our home! Meanwhile, we have farm work to do. And we are working everyday during this essential planting time. If you have some time to spare and a desire to play in the dirt, come join us. Any amount of work helps us have more great food for our CSA members this year.